[MOC] Ice Dragon. Fire Dragon. i'm not a big fan of brick-built animals, but this dragons... oh my god! Are awesome!!! Like @bungeshea said, they are the perfect companion to the minifigures... Congrats! Awesome Bombarda!!! The effect of the shoot is great! Beautiful Castle! Very neat and clean! Awesome! Wasn't this a Wolfpack castle?? Just saw it on flickr. Awesome builds! Great great great!!! I think the build is blocky cos Uter has "old pieces". Don't know if it is the case, but i also build blocky mocs because i don't have a lot of bricks with studs on the side, or tiles ones, or even in diferents colors (only have light gray, and dark gray, green, white and black, some tan and a few browns). I think the landscape is good enought and works well to highlight the fortress. But is just my opinion. Very nice! 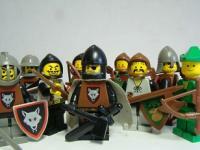 Now is the time to make a moc with the great fight; Goblins vs. Elf; ¡Spiders and boars vs Sky Lions! Great work! Very nice! As Schreeuwwitje said, you can absolutly feel the atmosphere! That's a great Wolfpack Fortress!!! I would think twice before attacking it! What i like the most is the rock work with the grass, it helps a lot to break the "squarish" look (¿squarish? <---- 'blockiness' -I'm having trouble with this concept-) Great work! Awesome build! You should post the first image in the Historic forum! It's great! Post Your Castle Army Here! Hi everyone! I haven't upload yet my 'armies' because my good camera died. I have a small collection, and my armies are seven or eight groups with 4-9 guys each, also i always make an effort to evoid repeated faces. That's the type of army i like. However, i agree with Rogue Armor, this is the "Post Your Own Army" thread and is great to watch everyone's armies (big or small ones, weirds, regulars,colorfull or not)!